It’s party time! 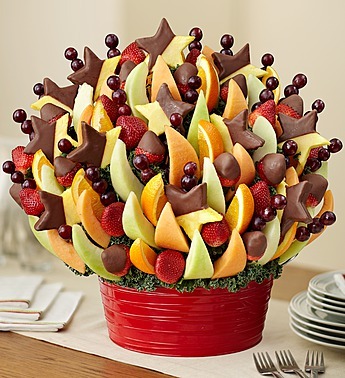 Get everyone’s mouth watering with this great big arrangement of fresh and tasty fruit. Displayed in a bright red reusable tin, our crowd-pleasing creation is loaded with dipped star-shaped pineapples, strawberries, melon and more sweet surprises to satisfy all those hungry guests.